Care Coordinators play a crucial part in healthcare facilities by taking responsibility for providing patient care by undertaking exceptional coordinating activities. 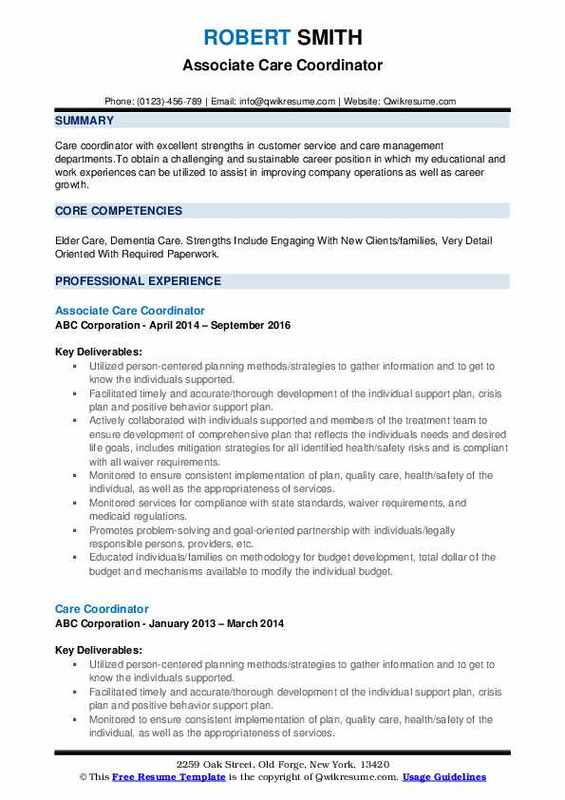 A professional Care Coordinator Resume mentions duties such as – managing and overseeing care provider team, communicating with caregivers and patient family; managing caregiver schedule, maintaining accurate documentation, maintaining compliance with legal requirements, developing treatment plans, supervising and assessing caregivers, collecting feedback from patient and their family members and participating in hiring, training and disciplining processes. 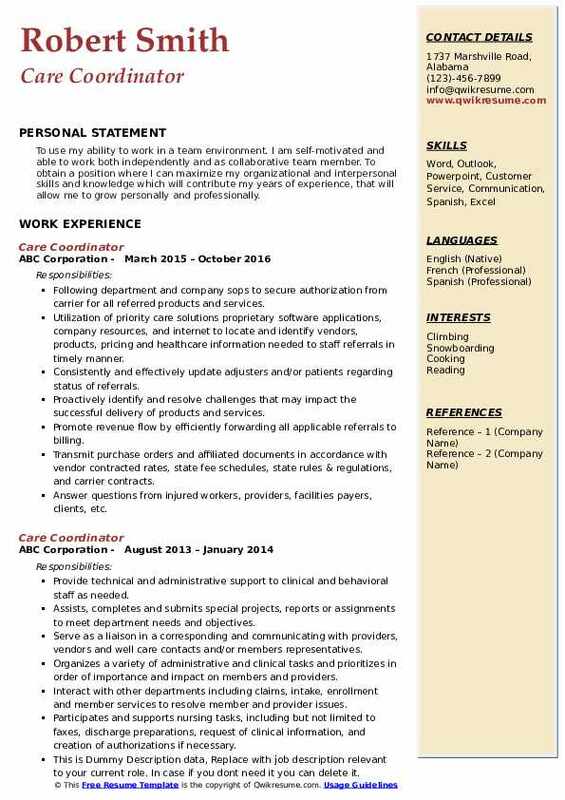 Employers want to see these competencies in the resumes for this employment – experience inhealthcare fields or domicile care; awareness and commitment to legal and corporate rules; basic clerical and bookkeeping skills, excellent phone etiquette, and the ability to multitask. A bachelor’s degree in relevant field is mandatory for this role. However, possessing additionally a professional certification will enhance job prospects. Summary : Possess a solid background in private physician practice with 15 years clinical experience as an MA/LPN in Primary Care and 6 years experience in Hospital Health Care IT&S. Results oriented and highly organized individual with well-developed team building, written and verbal communication, outstanding customer service, intrapersonal and marketing skills. Collaborate with cms, bcbst, humana, cigna, and aco practices to meet program specific goals via incentive guidelines and heidis supplemental data. Participate in pay for performance programs based on the triple aim approach. Encourage and educate aco participating practices to engage in activities that will increase quality of care and decrease healthcare costs. Monitor stars ratings and performance of aco participating providers and target low performing providers. Implement practice surveys to increase customer/patient satisfaction to impact cahps survey results. Troubles shoot issues with "gaps in care" not closing via attestation processes or claims submission. Coordinate learning opportunities for practices, aco, and community partners. Collaborate with local hospitals and facilities to encourage sharing of pertinent patient information to facilitate appropriate care coordination and continuity of care. Evaluate and identify tools and resources that affect pay for performance outcomes. Teach practices to gather specific heidis information as it pertains to quality measure reporting to cms to meet and achieve mssp via gpro. 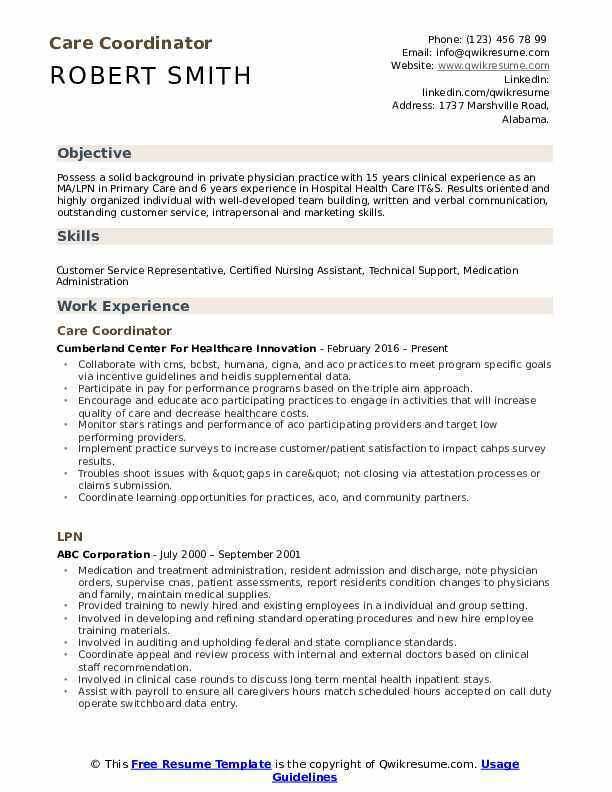 Objective : Care coordinator with excellent strengths in customer service and care management departments.To obtain a challenging and sustainable career position in which my educational and work experiences can be utilized to assist in improving company operations as well as career growth. Skills : Elder Care, Dementia Care. 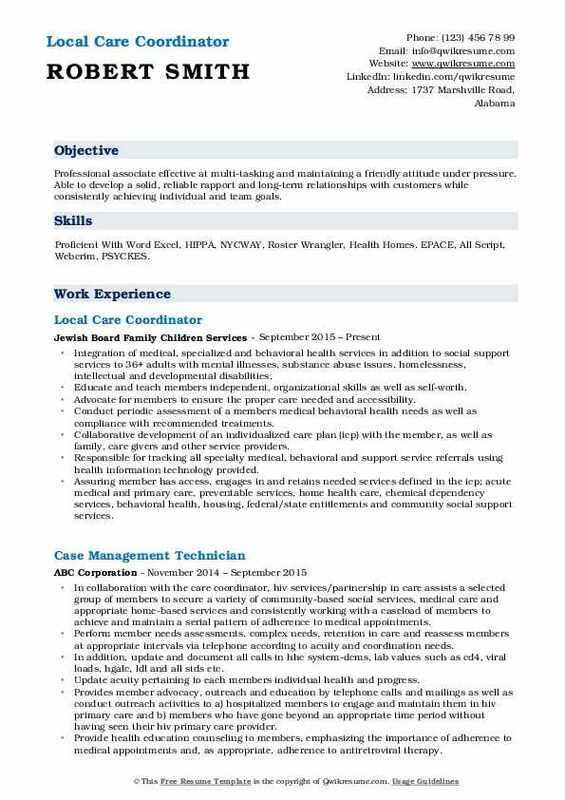 Strengths Include Engaging With New Clients/families, Very Detail Oriented With Required Paperwork. Utilized person-centered planning methods/strategies to gather information and to get to know the individuals supported. Facilitated timely and accurate/thorough development of the individual support plan, crisis plan and positive behavior support plan. Actively collaborated with individuals supported and members of the treatment team to ensure development of comprehensive plan that reflects the individuals needs and desired life goals, includes mitigation strategies for all identified health/safety risks and is compliant with all waiver requirements. Monitored to ensure consistent implementation of plan, quality care, health/safety of the individual, as well as the appropriateness of services. Monitored services for compliance with state standards, waiver requirements, and medicaid regulations. Promotes problem-solving and goal-oriented partnership with individuals/legally responsible persons, providers, etc. Educated individuals/families on methodology for budget development, total dollar of the budget and mechanisms available to modify the individual budget. Knowledge of assessment and treatment of intellectual/developmental disabilities, with or without co-occurring mental illness. 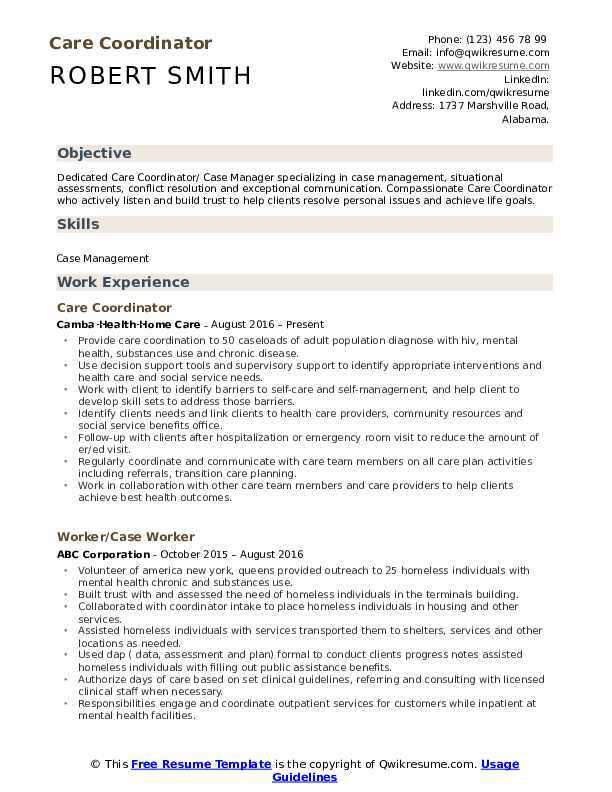 Headline : To obtain a position as a Case Manager or Client Service Coordinator which will enable me to make contributions based on my training and experience in health care while providing new and challenges and potential for further professional growth and development. Responsible for coordinating the access and delivery of support and services noted in annual health home care plan designated for individuals dual diagnosed with chronic health issues such as diabetes, hiv and/or hepatitis and a mental health diagnosis. Responsible for locating and creating natural support and community resources. 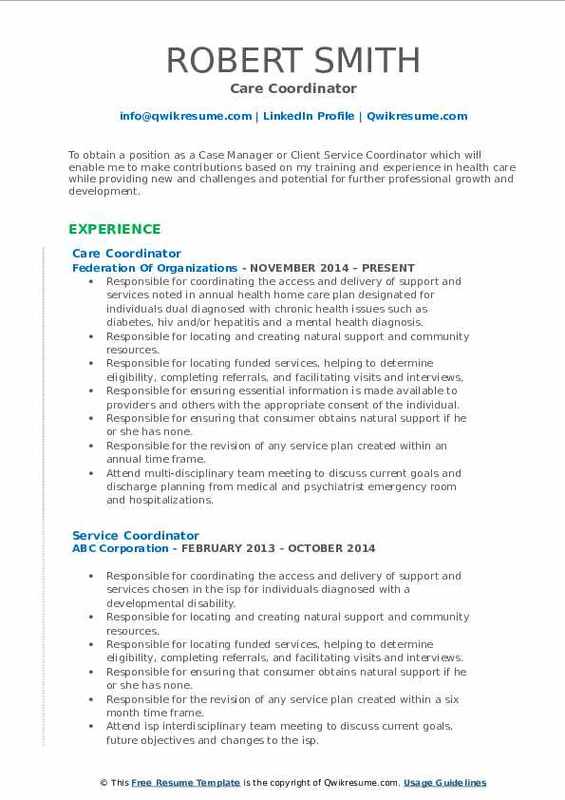 Responsible for locating funded services, helping to determine eligibility, completing referrals, and facilitating visits and interviews. Responsible for ensuring essential information is made available to providers and others with the appropriate consent of the individual. Responsible for ensuring that consumer obtains natural support if he or she has none. Responsible for the revision of any service plan created within an annual time frame. Attend multi-disciplinary team meeting to discuss current goals and discharge planning from medical and psychiatrist emergency room and hospitalizations. Responsible for ensuring that level of care assessments are completed annually. Objective : To obtain employment at a health care facility where I can fully utilize my nursing experience, education and cultural awareness to provide the best care possible to all assigned patients and those in need. Responsible for facilitating appropriate health care services throughout the continuum of care for the patient by screening and obtaining essential data for determining the patient's needs prior to and up to discharge. Utilize collaborative and systematic processes to assess, plan and coordinate the implementation of services and necessities that meet the individual's health needs; for example, durable medical equipment (dme), home health services in the form of nursing care, physical, occupational or speech therapy upon discharge for improved outcomes in health. Communicates with physician, payers and other health care providers to ensure quality care and promote fiscal responsibility through the appropriate utilization of resources while simultaneously ensuring the best health care delivery. Facilitates the overall quality, completeness and accuracy of the medical record to ensure discharges and /or transfers to a different level of care are efficiently processed. Through extensive interaction with physicians, nurses and other care givers, achieves appropriate documentation to support the medical necessity and level of services rendered to all patients in order to ensure the payers cover necessary expenditure and the patient is responsible only for co pays and deductibles. Assist with the ongoing development and delivery of education on documentation guidelines, coding and reimbursement rules for all members of the patient care team. Provides services to patients throughout the lifespan including newborns, children, adolescents, adults and geriatric age groups. Objective : Professional associate effective at multi-tasking and maintaining a friendly attitude under pressure. Able to develop a solid, reliable rapport and long-term relationships with customers while consistently achieving individual and team goals. 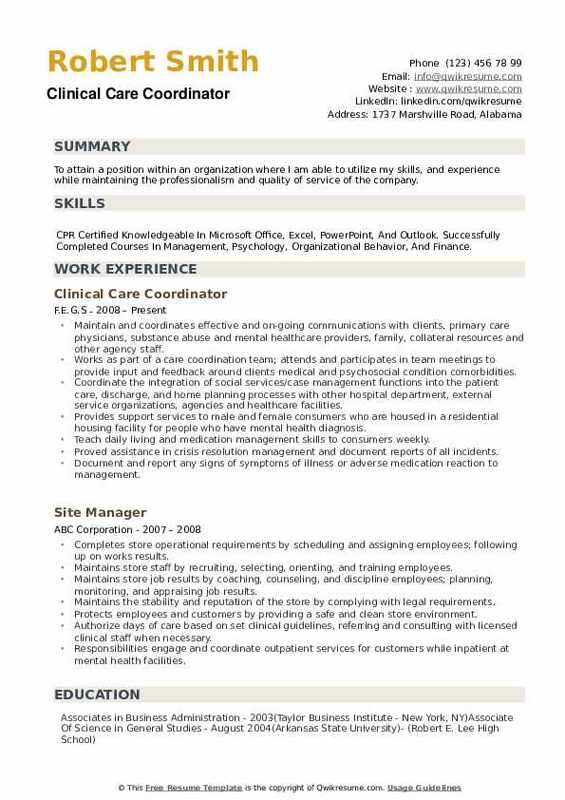 Skills : Proficient With Word Excel, HIPPA, NYCWAY, Roster Wrangler, Health Homes. EPACE, All Script, Webcrim, PSYCKES. Integration of medical, specialized and behavioral health services in addition to social support services to 36+ adults with mental illnesses, substance abuse issues, homelessness, intellectual and developmental disabilities. Educate and teach members independent, organizational skills as well as self-worth. Advocate for members to ensure the proper care needed and accessibility. Conduct periodic assessment of a member's medical behavioral health needs as well as compliance with recommended treatments. Collaborative development of an individualized care plan (icp) with the member, as well as family, care givers and other service providers. Responsible for tracking all specialty medical, behavioral and support service referrals using health information technology provided. Assuring member has access, engages in and retains needed services defined in the icp; acute medical and primary care, preventable services, home health care, chemical dependency services, behavioral health, housing, federal/state entitlements and community social support services. Summary : Seeking a challenging position, where my skills can be applied towards the goals of an organization. Desire strong work ethic, attention to detail, and opportunity for growth. In addition, I would like to showcase my strong organizational skills and ability to work well with people. Skills : Management, Microsoft Applications Office, Excel Spreadsheet, Powerpoint. Worked with a multidisciplinary healthcare team in a primary care setting within a variety of physician practices, focusing on coaching and coordination of care for summit health solutions high risk patients. Primary focus was on complex patient needs, as well as on transitions of care. Support of the patient's ability to better direct their own health care experience through the use of assessment and intervention, educational programs, and linkage to health services and community resources. Encouragement of respect for individuality, independence and patient choice collaboration on policies and systems that respect the cultural, religions, and ethnic differences among patients and family. Promotion of patient-centered care, frequent contact with primary care providers and medical home team members active participation in multidisciplinary patient-centered team meetings. Daily activities involved ongoing assessment, planning, implementation, coordination, monitoring, and evaluation. Special assignment opportunities included training and orientation of new staff, assisted in creating assessment tool used for initial intakes for each patient identified as needing social worker coordination. Assisted in creating policies for summit medical group related to patients who present to the offices or via telephone with suicidal ideations, and educated physicians and staff on roles and responsibilities of social work in the primary care setting. 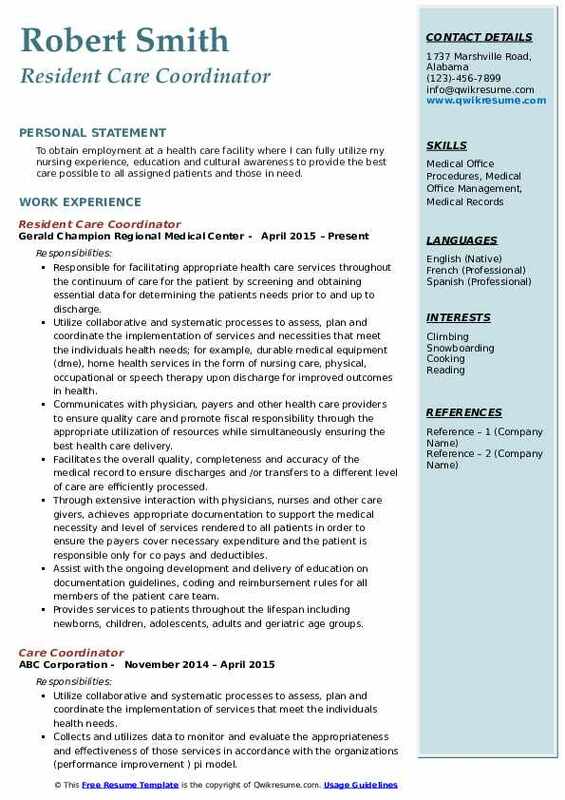 Objective : Eager and looking to continue to build a stable career in the medial field where I can utilize my organizational, time-management, patient care and communication skills in the medical field. To continue to grow and learn with education and hands on experience and move up in a management position where I can exhibit my leadership skills. Telecommuter, coordinate care of individual medicaid members receiving long term care services with application to identifying populations with a range of disabilities using assessment (mi interviewing skills), care planning, implementations, coordination, community resources, monitoring and evaluation for cost effective plans. Ensure appropriate interventions, cost effective delivery of quality care and services across the continuum. Authorize community and home based services identified on comprehensive needs assessment, to ensure eligibility as well as meeting the criteria for receiving community based services. Serve as the point of contact for nursing homes assigned to within the northern new mexico region, making monthly contacts with the members that are on the health plan and participated in the care plan meetings as well as working on transitioning the member back into the community. Responsible for completing health risk assessment and/or comprehensive needs assessment which include, but not limited to psycho-social, physical, medical, behavioral, environmental, and financial parameters; assessing members with chronic or complex conditions which require intensive interventions and oversight include multiple, clinical, social and community resources or behavioral health referrals. Implement, coordinate, and monitor strategies for members and families to improve health and quality of life outcomes, responsible for serving as point of contact to member's, providers, servicing agencies, core facilities to communicate plan for authorization of services to ensure quality of care. Serve as mentor care coordinator and training on boarding care coordinators. Objective : To use my ability to work in a team environment. I am self-motivated and able to work both independently and as collaborative team member. To obtain a position where I can maximize my organizational and interpersonal skills and knowledge which will contribute my years of experience, that will allow me to grow personally and professionally. Following department and company sop's to secure authorization from carrier for all referred products and services. Utilization of priority care solutions proprietary software applications, company resources, and internet to locate and identify vendors, products, pricing and healthcare information needed to staff referrals in timely manner. Consistently and effectively update adjusters and/or patients regarding status of referrals. Proactively identify and resolve challenges that may impact the successful delivery of products and services. Promote revenue flow by efficiently forwarding all applicable referrals to billing. Transmit purchase orders and affiliated documents in accordance with vendor contracted rates, state fee schedules, state rules & regulations, and carrier contracts. Answer questions from injured workers, providers, facilities payers, clients, etc. Maintaining accurate system for tracking staff availability and staffing assignments. Summary : To attain a position within an organization where I am able to utilize my skills, and experience while maintaining the professionalism and quality of service of the company. Skills : CPR Certified Knowledgeable In Microsoft Office, Excel, PowerPoint, And Outlook. Successfully Completed Courses In Management, Psychology, Organizational Behavior, And Finance. Maintain and coordinates effective and on-going communications with clients, primary care physicians, substance abuse and mental healthcare providers, family, collateral resources and other agency staff. 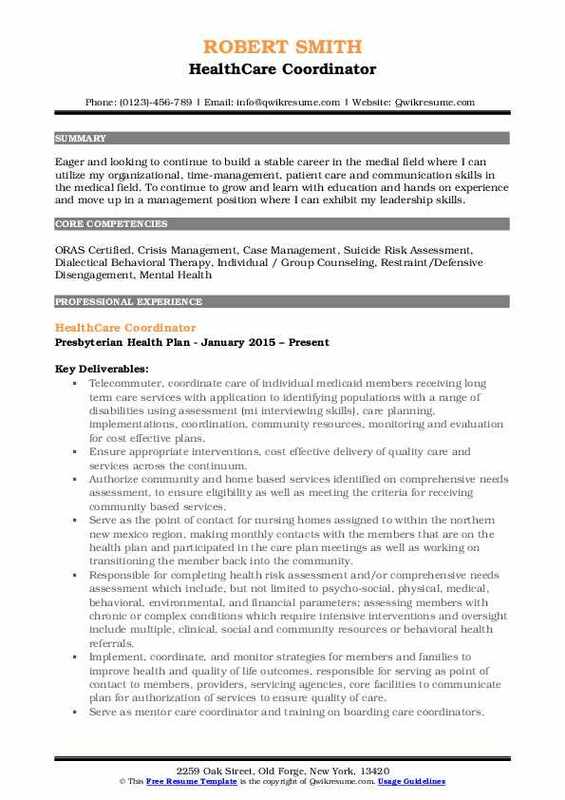 Works as part of a care coordination team; attends and participates in team meetings to provide input and feedback around client's medical and psychosocial condition comorbidities. Coordinate the integration of social services/case management functions into the patient care, discharge, and home planning processes with other hospital department, external service organizations, agencies and healthcare facilities. Provides support services to male and female consumers who are housed in a residential housing facility for people who have mental health diagnosis. Teach daily living and medication management skills to consumers weekly. Proved assistance in crisis resolution management and document reports of all incidents. Document and report any signs of symptoms of illness or adverse medication reaction to management. 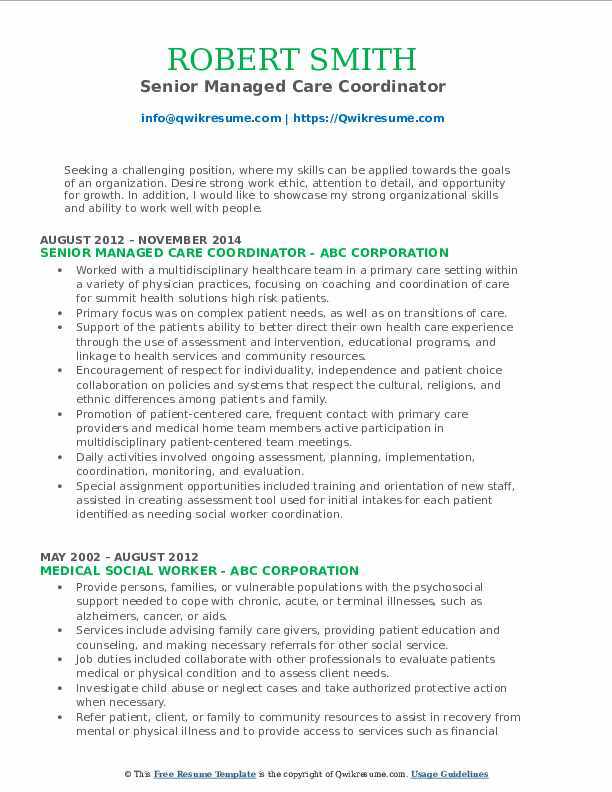 Objective : Dedicated Care Coordinator/ Case Manager specializing in case management, situational assessments, conflict resolution and exceptional communication. Compassionate Care Coordinator who actively listen and build trust to help clients resolve personal issues and achieve life goals. Provide care coordination to 50 caseloads of adult population diagnose with hiv, mental health, substances use and chronic disease. Use decision support tools and supervisory support to identify appropriate interventions and health care and social service needs. Work with client to identify barriers to self-care and self-management, and help client to develop skill sets to address those barriers. Identify clients' needs and link clients to health care providers, community resources and social service benefits office. Follow-up with clients after hospitalization or emergency room visit to reduce the amount of er/ed visit. Regularly coordinate and communicate with care team members on all care plan activities including referrals, transition care planning. Work in collaboration with other care team members and care providers to help clients achieve best health outcomes.